Our six rustic log cabins have been restored to accommodate today's adventurers. Authentic themed homestead cabins feature rustic luxury with queen beds, down bedding, wood burning stoves, and hand-crafted quilts. Grandma's Cabin dates back to the early 1900's when the Chistochina Roadhouse was built. This outlying cabin is known for the Roadhouse owner's mother who made it her home. Hermit's Roost is off by itself on the edge of a sunny glade. It's a good choice for travelers seeking seclusion or for a small group of tent campers wanting access to their own kitchen and bath. Appropriately named, this fish themed log cabin features fish carpeting, fish curtains, fish quilt, and an old fishing lure sign. The luxurious log bathhouse is just a few steps away. Homestead log cabin situated in a sunny clearing on the edge of the forest just off the trail of a Caribou crossing. One can walk a portion of the old Valdez to Eagle Trail in back of this cabin. Unlike the "cabin fever" with need to escape, which can occur after being cooped up over a long cold winter, this cabin draws one in with lively cheer. A "bunkhouse" cabin appealing to small groups. Features four twin beds, each with its own screened window and reading lantern. Newly built in 2007, this log building is constructed from naturally aged logs downed in an Alaskan forest fire 18 years ago. The logs were peeled and hand scribed to make an unusually beautiful camp bathhouse. 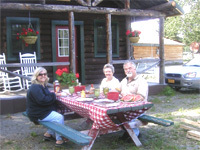 Red Eagle Lodge welcomes groups. We are happy to serve business meetings, retreats and reunions, special interest groups, events, and celebrations.